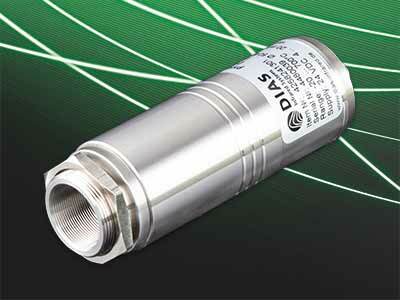 The German manufacturer DIAS Infrared expands its PYROSPOT pyrometer series. The new PYROSPOT series 25 provides stationary digital 2-wire pyrometers with a temperature linear output 4 to 20 mA.A compact stainless steel round housing (protection class IP65) and small diameter (outer thread M25) enables use in harsh industrial environments. The complete parameterization can be done via parameterization interface and software on a PC or with an optionally available small handheld programming device. A parameterization ex factory is also possible. From now the first model DT 25L is available with a temperature measurement range from -20 °C to 700 °C and a spectral range from 8 µm to 14 µm. It is suitable for non-contact temperature measurements, for example on non-metals and coated metals.